Wood gas, also called “holzgas”, air gas or blue gas, is the product of thermally gasifying a biomass material. Wood gas is generated in a high temperature chemical reaction (>700°) between the wood and a limited amount of steam or oxygen. The heat and lack of oxygen causes the gases int the wood to release in the form of carbon monoxide, hydrogen and carbon dioxide. Our boilers pull the wood gas mixture that is created in the upper wood loading chamber into the lower combustion chamber and burn it at temperatures around 2000°. After the gas is burned, any left over emissions exit through the chimney flue. 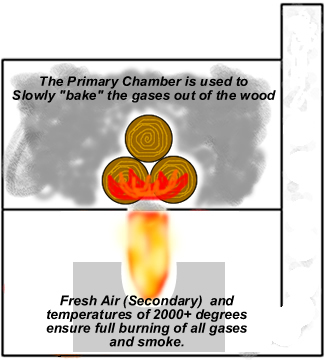 The most notable indicator of effective gasification is the lack of smoke exiting the chimney. Wood as a fuel is a good solution due to the fact that it is a renewable resource like solar, water or wind power.